After a terrorist attack to an American housing compound in Riyadh, Saudi Arabia, where families and the spy Francis Manner are murdered, FBI agent Ronald Fleury blackmails the South Arabian consul to get five days of investigation in the location. He travels with agent Grant Sykes, Janet Mayes and Adam Leavitt to revenge their friend and try to find the responsible for the bombing. 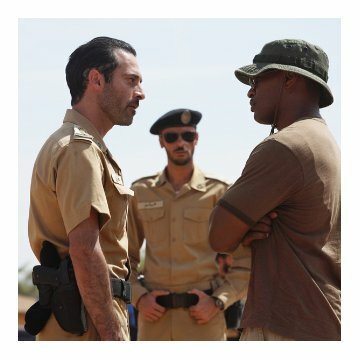 The agents find all sorts of difficulties in their investigation, but they are supported by Colonel Faris Al Ghazi that advises the team how to act in a hostile environment. Taglines: Under fire. Under pressure. Out of time. The end of the movie dedicates it to Thomas Aguilar, Lance Gunnin and Nick Papac, all crew members who died during production. Thomas Aguilar (Tom Aguilar, prop maker) died one week after being admitted to the hospital for stomach pain and subsequently discovering he had prostate cancer. Lance Gunnin (construction worker) was killed in a motorcycle accident on his way to the set and Nick Papac (prop master) died in an on-set collision between his Gator all-terrain vehicle and an SUV. Continuity: In the scene where the father with the missing fingers, pulls his weapon and is shot several times in the chest, but when the little girl runs over to him and lays in his arms, the bullet holes are gone and so is the blood. 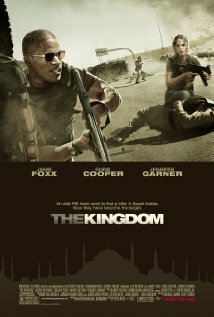 If there's one flaw plaguing Peter Berg's The Kingdom, it's that it tries to be all things to all people. OK, maybe not all things as it definitely doesn't try the romance angle. 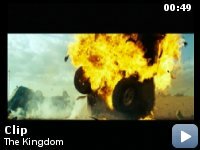 That's not to say The Kingdom isn't a terrific film, because it is. However, it should have been decided at the outset to make this movie either a political or action thriller, and gone with one or the other. 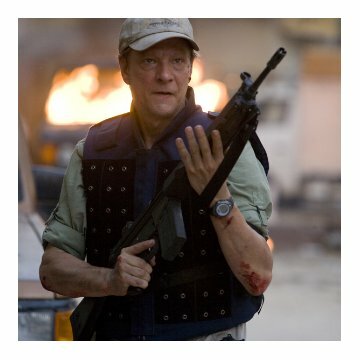 Matthew Michael Carnahan's script starts out hitting all the right action beats as it unfolds with a vicious terrorist attack on a Saudi compound housing employees of an American oil company (the movie draws inspiration from the 2003 compound bombing in Riyadh). From there the movie almost threatens to get bogged down as it shifts focus to the political machinations both hindering and enabling a joint Saudi/FBI investigation. Fortunately, Berg pulls the film out of this quagmire that threatens to put the breaks on the movie almost as surely as the political attempts to nix the joint investigation. With the political jabber out of the way, The Kingdom gets down to the meat of the script, shifting the Saudi investigation into high gear and refusing to take its foot off the accelerator. The movie deserves full marks for refusing to dumb down its story and make the Saudis appear as little more than window dressing to a big screen American shoot-'em-up. While Jamie Foxx, Jennifer Garner, Chris Cooper and Jason Bateman all get top billing, the real star of this story is Ashraf Barhom who plays Saudi police Col. Al-Ghazi, a man dedicated to his profession, with an acute sense of fair play, protocol and justice. Al-Ghazi, who was at the scene of the initial attack on the compound, initially plays the role of hamstrung go-between relegated to babysitting and restricting the movements of the FBI at the urging of higher-ups. However, thanks to a fortuitous face-to-face between the American "guests" and a Saudi Prince, Al-Ghazi is given free reign to lead the US investigators as they try to uncover the mastermind behind the attack. From there, the audience is treated to a top notch story that nicely touches on everything from culture clashes, forensic revelations, kidnapping, religious doctrine, and the self perpetuation of hate, all of which culminates in a final half hour of riveting, vicious, blood spattering action. I said The Kingdom suffered from one flaw? On second thought, make that two. It's also yet another victim of the hand-held cameraman suffering from Delirium Tremens, complete with blurry and shaky shots that rarely allow the viewer to actually focus on the images being played out. One day Hollywood will learn that this type of cinematography just doesn't cut it. Sadly, this is not that day. That said however, The Kingdom delivers a smart, taught, evenly balanced thriller that easily shapes up as a heavyweight in this year's run for the Oscar.